A picture is worth a thousand words, especially when you are trying to convince a client to spend money. Taking a client’s logo and putting it on a promotional product is very effective. So much so, that most promotional products companies offer “virtuals” as a selling tool. Some companies charge, some have a long turn over. What to do if you need something quick for a meeting?? Try a classic embroidered effect created in DRAWings Embroidery Effect by DRAWstitch Technology. It’s a FREE download! DRAWings has just a few options, but the results are impressive. The Import file format can be AI, EPS, JPG, PNG and even GIFs. Note — AI and EPS files will need to be downsampled to Illustrator 8. The DPI setting will determine the size of the output file. Setting it to 600 will generate a large file perfect for Photoshop. The Fabric Type will determine the intensity of the embroidery. A Heavy setting ensures a good effect for Photoshop. Once you have the embroidered logo, simply import it into Photoshop and use the Warp tool to manipulate the image to the product. 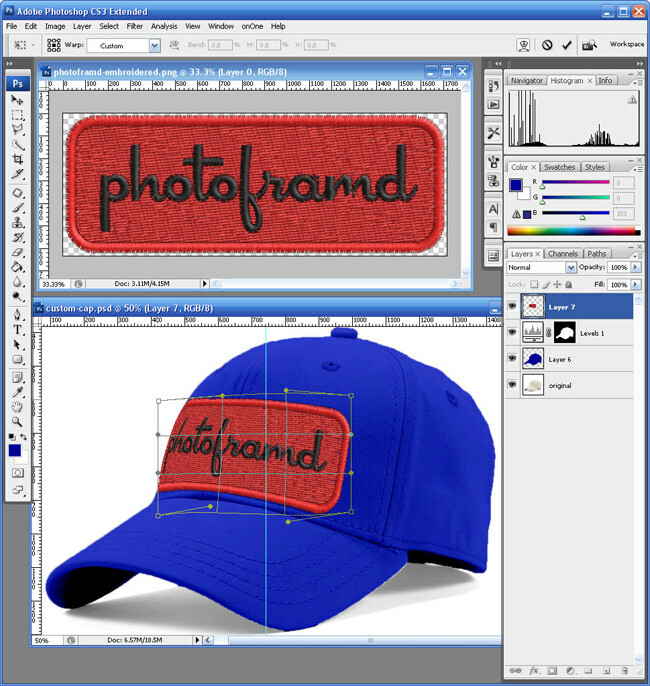 See the screen capture below where I take my Photoframd logo and warp it to fit the royal blue cap. The end result is very effective…and persuasive! Your client will be very impressed with the virtual and with you for presenting it! NOTE: This software is Window only! Mac users would need to run this program in emulation mode. I sure would love to know how you did this. When I try the same thing in AI CS3, my text has jump stitches between the letters and the text isn’t in satin stitch, it’s in fill stitch. The border around the rectangle is also not in satin stitch. I get jump stitches on everything, in fact. Would love to know how you eliminated those. Did you downsample the AI or ESP file to Illustrator 8? I found that to be necessary to get a good stitch rendering. Also, make sure that you increase the DPI to at least 600. Even if the output is too large, when you resize it in Photoshop, it will look better. Yes, I did both of those. I have discovered since then, though, that the original vector file needs to be low resolution when run through the embroidery app in order to get the satin stitches where you want them. If you use a resolution higher than 100 ppi it will turn everything into fill stitching. I still can’t get rid of the jump stitches, though. Have you tried your logo with a font that isn’t script? I’d love to know if you get jump stitches then. The way I’ve gotten around it is to convert the patch first and then do the lettering, and put them together in Photoshop, but if you have several layers this will get very complicated. Some vector clipart doesn’t produce jumpstitches, and I cannot figure out why. This program is the “lite” version. Their professional version is used by embroiderers. I have used the lite version with several different logos for a client. The results were good enough for their print catalog. I did have problems with a few logos, but using the Illustrator 8 format resolved them. Previously, I had emailed the developer and asked his suggestions. He said to try a GIF or JPG to see if that produced better results. Hope that helps. Thanks for the info. I tried downloading the evaluation version of their pro software but my computer isn’t powerful enough to run it–it crashes as soon as I open it! So I’m afraid I’m limited to the lite version. I have discovered that if I use images, either .eps or .cmx, created in Corel Draw they don’t seem to produce the jump stitches, while images created in Adobe Illustrator–even .eps–create them. The program seems to have some interesting “anomalies” which I’m trying to map out so I can use it effectively. I’m a digital scrapbooking designer and need high resolution images for my work. I found one vector clipart company whose licensed graphics work like a dream in this software, but the clipart from many other sources “crash and burn” ;-). love the tutorial and the further application. 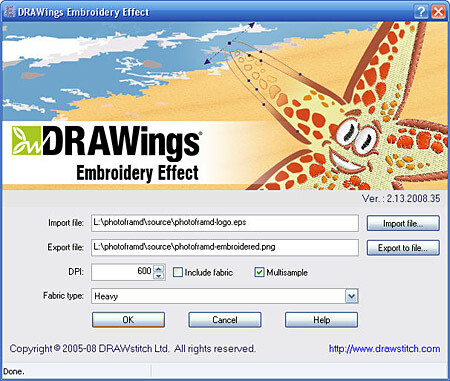 Is Drawings Embroidery Effects compatible with Macs? Sorry, but this software is only available for PCs. The Pro-version is built around Corel Draw which is also PC. Well, I’ve tried everything and no matter what ppi/dpi, format, bitmap vs vector, fabric type, etc. all I get is cross stitching. I’m working with Photoshop ver 7. Sorry, but I have not used this program in quite a while. I remember it being a little temperamental. It worked best with Illustrator files saved to Illustrator8 format. Other than that, you will need to contact http://www.drawstitch.com.